Replaces: YTX7A-BS, PTX7A-BS, 12N7E-B, YTX9-BS, GTX9-BS, YTZ10S, GTZ10S, PTZ10S, YT12A-BS, PT12A-BS, GT12A-BS, YTZ12S, GTZ12S, PTZ12S, YTZ14S, GTZ14S, and the PTZ14S. 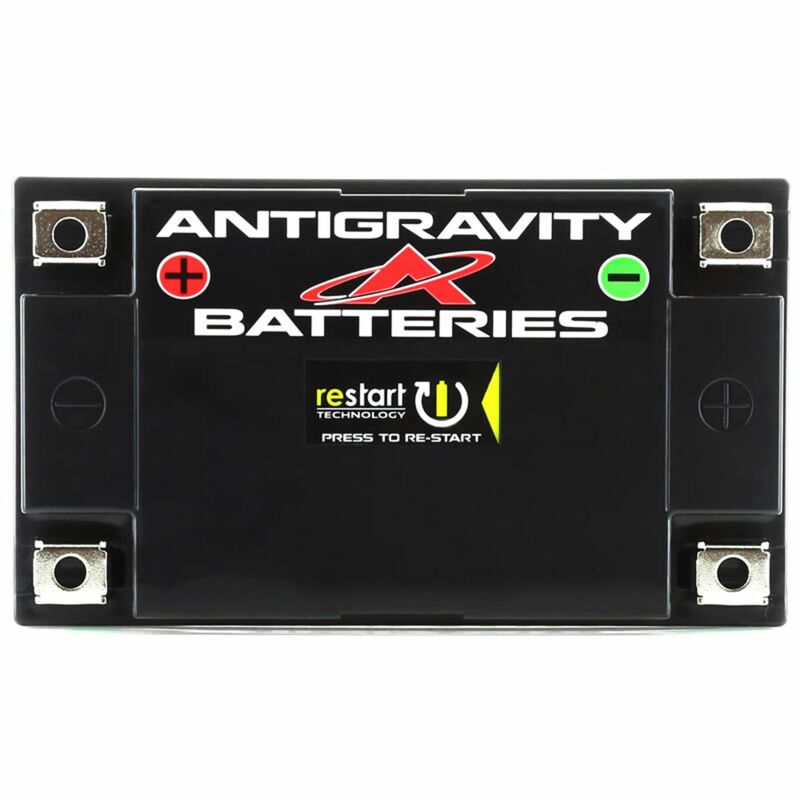 The NEW Antigravity ATZ10-RS battery is built with Antigravity's groundbreaking RESTART Technology (built-in jump-starting) so you won’t ever get stranded with a dead battery again! 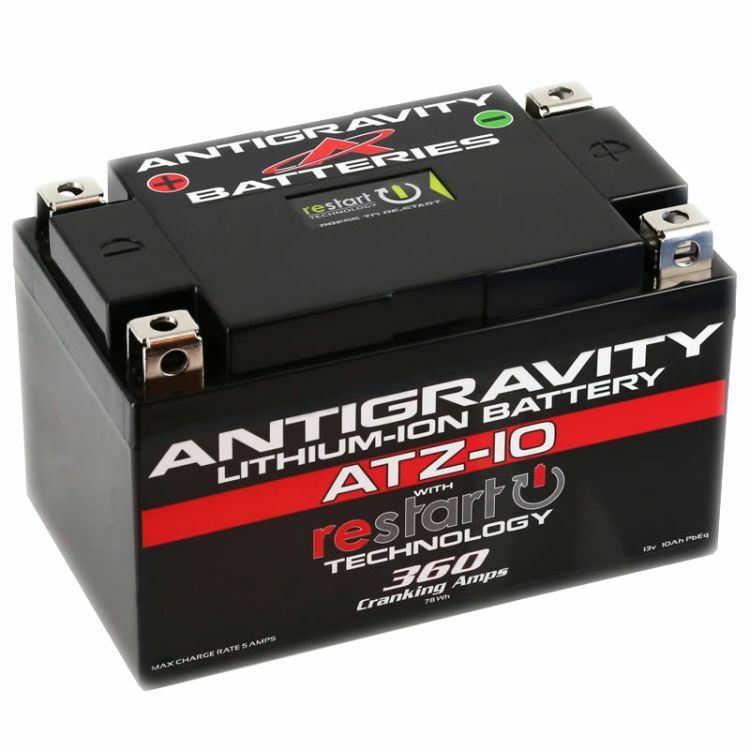 The ATZ10-RS is a hi-power, lightweight Lithium-Ion battery that directly replaces the OEM Lead/Acid YTX7A-BS, YTX9-BS, YTZ10S, YT12A-BS, YTZ12S, and the YTZ14S. The revolutionary ATZ10-RS RE-START Battery intelligently monitors its status, and just before going completely dead puts itself to sleep with just enough energy to get your vehicle started again. Simply press the RE-START button located on the battery, start your vehicle and drive away… No more dead battery emergencies or being stranded! The new ATZ-10 Re-Start Battery is an extremely lightweight and high-power Lithium-Ion replacement for the heavy lead/acid battery found in many motorcycles including most every Enduro bike on the market. Additionally, the new ATZ-10 offers the first FULL Battery Management System (BMS) found on a Powersport Battery and includes low-voltage cut-off, over discharge, over-charge, and thermal protections with real time lithium-ion cell balancing. Per Antigravity Inc.: *** Over-Charge protection will not protect from a faulty/old Voltage Regulator spiking Hi-Voltages to Battery. If you have a Pre-1990s Motorcycle replace your voltage regulator; it is over 25 year old and most likely broken by now. Do you own the AG-ATZ10-RS? Please, tell us what you think about it. It helps us provide you with better products. Please note that it may take up to 72 hours for your review to appear. Battery is fine, but should not be used with a BMW S1000rr. It threw over-voltage alerts on ECU, headunit and ABS which resulted in bike shutting off after about 10 seconds cumulative use of the TC (track bike). Testing voltage showed 13.5v with bike running, which was apparently enough to make it unhappy. Replaced with a smaller li-ion and no further errors or issues. Mine is a 2012, but it's the same battery/ecu in all of the 1st/2nd gen at least.